So. Yesterday in Paris. Early exercise in the park followed by the world’s best breakfast. Seriously. Perfect croissant from Gerard Mulot. Butter that is so rich and sweet it is practically cream cheese, only purer and sweeter. Crisp , chewy baguette with that gorgeous butter and abricot jam. Spanish ham carved off the leg, aged mountain cheese. Sharp, milky yogurt with fresh raspberry confiture. Cafe au lait. Fresh squeezed orange juice and a dish of orange segments. Just lovely, and worth the price of the spendy hotel room at Relais St. Germain. Then, obviously, a nap. Slept for a lovely hour. Then out to the Marais, heading for the best falafel on the planet. Unbelievably, it was a Jewish holiday and they were closed. Other Jewish restaurants were open and we had a plate of spreads (hummus, eggplant caviar, really good tuna with Harissa, tzatziki), pastrami, grape leaves, and fried eggplant. All good. I ate pretty light knowing dinner was at 7:30. We took a walk after to one of our favorite churches — St. Germain l’auxerrois. Usually churches are cool sanctuaries on a hot day but it was an oven in there. Lit a candle for the people we miss and came on home. For dinner we are in. For most of the year Le Comptoir is an impossible-to-get reservation for dinner unless you are staying at the hotel. By day it is a fabulous and porky brasserie. In the later summer months the brasserie lasts all day and night while the restaurant takes a vacation. We had a stunning meal anyway. Jerry had a plate of pork — sausage, pâtés, fried bits. Some super yummy mustard and more of that butter. I had a bowl of gazpacho that was cool, creamy, spicy and full of pickled garlic and cherry tomatoes. For mains Jerry had a crock of brandade de morue which is one of his favorite things. I had had it there before and it was as good as ever. The salt cod was creamy and rich, full of garlic and potatoes like the ultimate pommes purees with a crispy gratineed top. Fabulous. 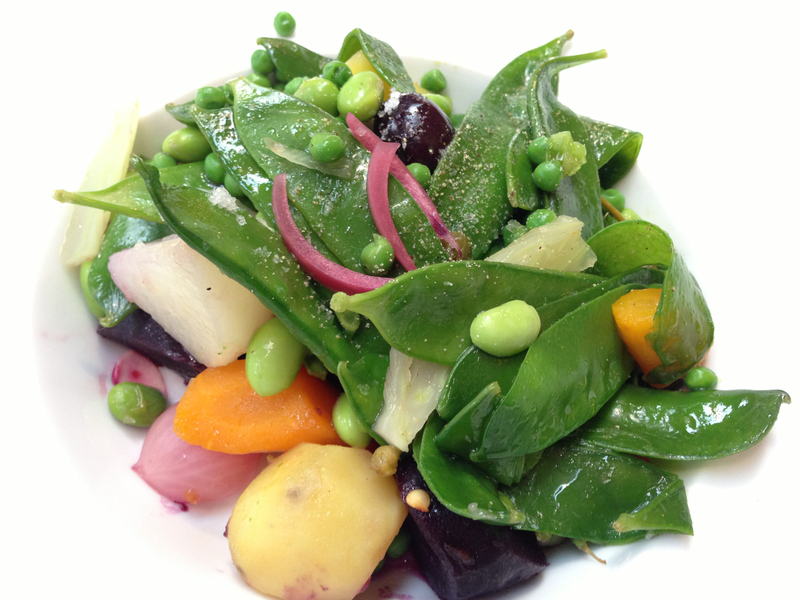 I had an assiette des legumes figuring that if anyone could do an excellent plate of vegetables, they could. Too right. Snap peas, English peas, fava beans, potatoes, beets, carrots in several colors, turnips, radishes and more of that garlic. A couple of marinated roasted pepper strips and two of the best olives I ever ate. It was just all steamed together in its own juice with pepper and sea salt — the flavor of the vegetables pure and intense. For dessert we had a cheese plate that had several cheeses I didn’t know and the server was too busy to explain. They were all excellent. And finally a salted caramel pot de creme that was heartbreakingly good. Up early this morning and on a plane by 7. Athens, via Rome. Our hotel was recommended by our travel agent. Must say I don’t usually have a lot of use for travel agents , but this guy has been spot on. We are at the St. George Lycabettus which is a pleasant place with lovely people, but what it has in spades is a view of the Acropolis. When I was taking all those years of Latin and Ancient Greek we read a lot of classics, but I never thought I’d be sitting on my hotel balcony gazing on the Parthenon all lit up against the dark sky. Really a special moment. Thanks, Goldring Travel!